The leader of the small, banned nazi group National Action, Christopher Lythgoe, was jailed for eight years at the Old Bailey, yesterday. He was found guilty of membership of the banned sect. This follows an investigation into a plot that he and others had planned, to kill Labour MP Rosie Cooper. National Action was banned by the former Home Secretary, Amber Rudd, after they sickeningly backed the murder of Labour MP Jo Cox, in 2016. National Action, as UAF and other anti fascists were aware, though banned, went underground. They used a variety of names such as Scottish Dawn. Lythgoe promoted a plan to kill Ms Cooper. Lythgoe was accused of giving permission to Jack Renshaw, 23, to carry out the murder of Ms Cooper at a meeting in a Warrington pub, on 1 July last year. Renshaw, an ex BNP organiser, admitted buying a 19-inch ‘Gladius Machete’ in preparation for murder, but jurors cleared Lythgoe of granting him permission to carry out the attack on behalf of National Action. Matthew Hankinson was also found guilty of being a National Action member. He was jailed for six years. Jurors failed to reach a verdict on Renshaw and two others accused of being National Action members. Renshaw had previously admitted to preparing to an act of terrorism and threatening a police officer. A former member of the nazi group, leaked news of the murder plot to the Hope not Hate group, which led to the police investigation and prosecution. Though small, their pernicious presence, as the judge noted, is ” “truly evil and a dystopian vision”. Those influenced by National Action include Zack Davies, who in 2015 was jailed for life, after nearly killing an Asian dentist in a Welsh supermarket. 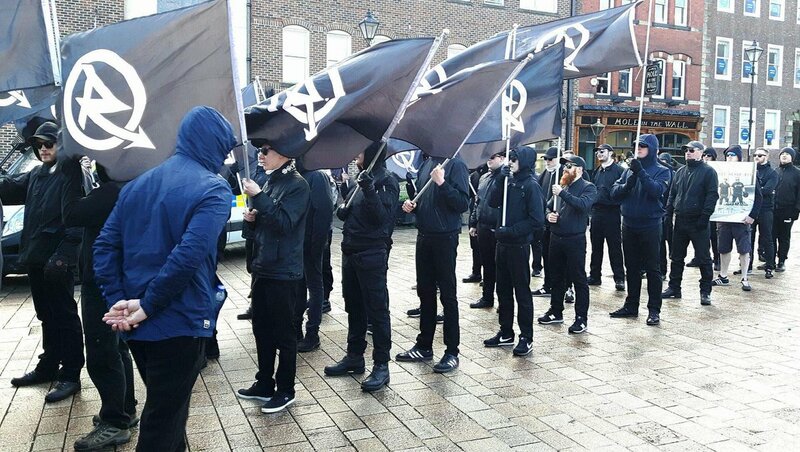 With the hardening up of supporters of Tommy Robinson, some on the fringes of the far right will continue to be attracted to groups such as National Action. It’s imperative that anti fascists keep broadening our forces and ranks; following the huge anti Trump demonstrations and successful anti fascist mobilisation last Saturday in London, this is a critical task.